Clean strawberries lightly with a pastry brush and keep it aside. Do not remove hulls. Line a flat tray or board with baking paper and keep it aside. Place white chocolate in a medium heatproof bowl and keep it over a pan of simmering water until chocolate has melted and mixture is smooth. Remove it from heat. 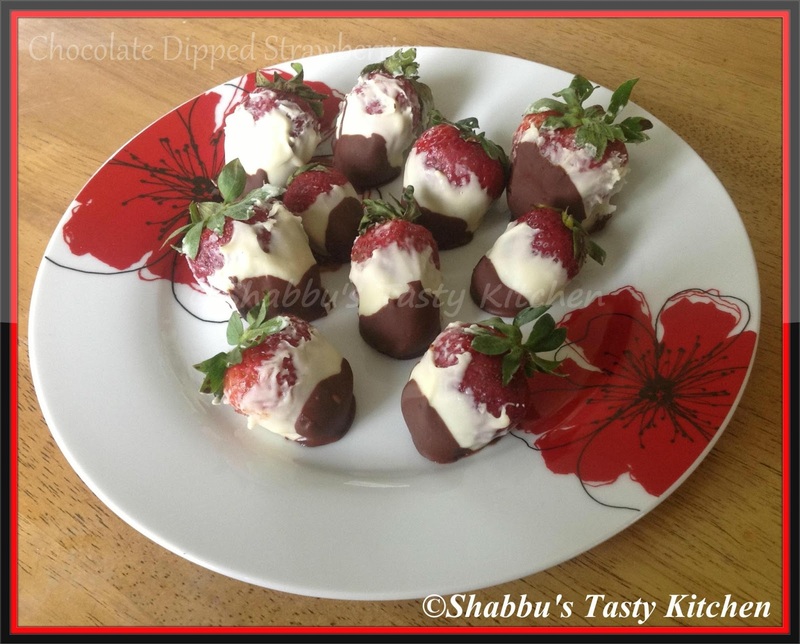 Dip each strawberry approximately two-thirds into the chocolate by holding by their tops. Drain excess,then place on prepared tray or board. Allow to set. 5. Place dark chocolate in a small heatproof bowl and keep it over a pan of simmering water until chocolate has melted and mixture is smooth; allow to cool slightly. 6. Dip a third of the coated strawberries in dark chocolate. Replace on paper tray or board and refrigerate until required. Chocolate coated strawberries will keep up to 12 hours in refrigerator. Drooling here.Beautifully done.Feel like grabbing from the screen.